This covers every eReader, and then some. Note that it can take weeks for our monthly issue to appear in those catalogs, so if you are too impatient waiting for your issue, you do have the option of using the direct links to your favorite format, which you can "sideload" on "your own. Once our monthly tasks in the four channels above are completed, then Nook is probably the first thing to show up. If they are not first in the eBook market, at least they can be first to market. This is for the monthly issues as eBooks only. It's almost unheard of to distribute a free monthly magazine to this extent, and it does take some time, which is why we also add additional, faster-time-to-market methods, outlined below. 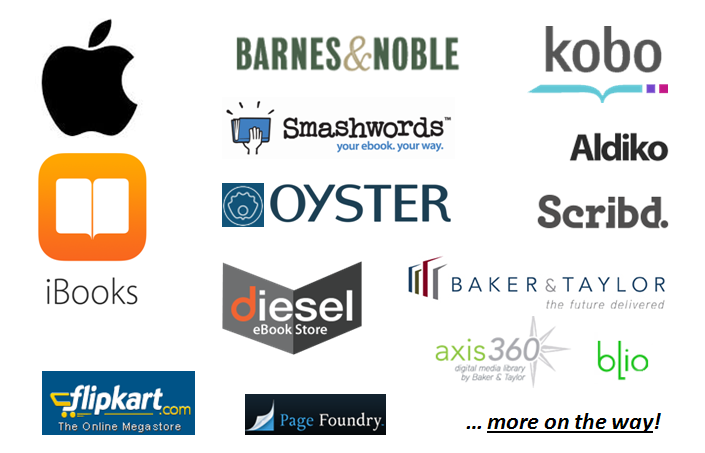 Page Foundry operates retail sites Inktera.com and Versent.com; and operates Android eBook store apps for Cricket Wireless and Asus, and other distribution outlets coming soon. ...and more on the way. We don't see Lulu getting straight to iBookstore℠ or NOOK in a timely fashion, so we'll actually maintain a direct publishing activity at Smashwords above. Lulu does have a nice storefront at Lulu.com. If they improve their eBook distribution then we might use them exclusively. We don't see either Smashwords or Lulu getting straight to Kindle in a timely fashion, so we'll maintain a direct publishing activity at Amazon KDP. We don't see any other way to get to the Google Play Books storefront (good for Android), so we'll maintain a direct eBook publishing activity at Google Play.